LOS ANGELES — Jeff Bezos, the billionaire founder of Blue Origin, says he supports a human return to the moon in cooperation with other nations, as other company officials suggest planning is underway for an announcement about such efforts later this year. 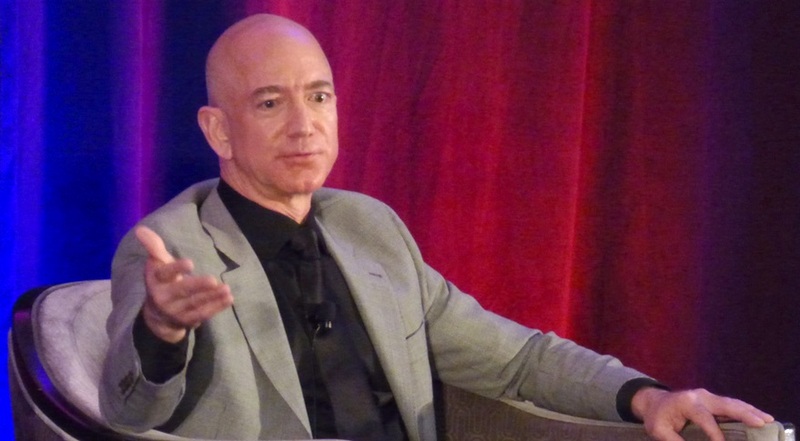 Bezos, speaking at the International Space Development Conference here May 25, said a permanent human presence on the moon was essential to his long-term vision of millions of people living and working in space. “Today, we must go back to the moon, and this time to stay,” he said in an on-stage interview with journalist Alan Boyle after accepting the National Space Society’s Gerard K. O’Neill Memorial Award, named after the physicist who proposed the concept of space colonies more than 40 years ago. That is part of an effort to lower costs to get to the moon through the company’s New Glenn orbital launch vehicle under development as well as a larger vehicle, New Armstrong, about which the company has released no details. “You do need big rockets to do the kinds of things we want to be able to do in space,” he said. Bezos said that he would be open to working in concert with other nations on establishing a lunar base. “I love the Moon Village concept,” he said, referring to a proposal promoted by European Space Agency head Jan Woerner for cooperation among countries and companies to cooperate, albeit loosely, on lunar capabilities. However, another company official suggested planning was underway for some kind of announcement later this year. Speaking at the Australasia Satellite Forum last week in Sydney, Ted McFarland, commercial director for Blue Origin, invited Australia and its new space agency to participate in an announcement at the upcoming International Astronautical Congress in Bremen, Germany, in early October. Bezos offered few near-term updates about Blue Origin’s plans, including progress on the New Glenn vehicle. He did state that the company had acquired the ship that will serve as the landing pad for the first stage of the rocket, and that refitting of the ship for that role would soon begin. He provided no updates on the BE-4 engine being developed for New Glenn and also in competition to be the first stage engine for United Launch Alliance’s Vulcan rocket. He said the company had yet to set a ticket price for its New Shepard suborbital vehicle, but that he expected to fly the vehicle frequently, building up experience on the BE-3 engine that will also be used on the upper stage of New Glenn. “It’s going to be the most reliable liquid hydrogen engine in the world,” he said of the BE-3. Bezos, who reiterated in his on-stage interview that he sells $1 billion a year in Amazon.com stock to fund Blue Origin, said he would be willing to invest in additional lunar capabilities beyond transportation to establish a base, but hoped that others would eventually step in to provide those services.